Pakistan Super League 2017 second edition is schedule to kick off in February. The second edition of Pakistan Super League (PSL2) Twenty20 will start on 9th February, 2017 in United Arab Emirates. The PSL T20 2017 is the second edition of Pakistan Super League with same number of cricket teams. 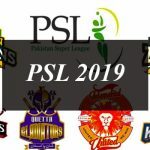 The 2nd edition of Pakistan Super League 2017 will be a big event as Pakistan Cricket Board (PCB) had made the inclusion more teams and foreign cricket players. The 2nd edition of PSL 2017 will be a tournament which will stay for four weeks this year. All the matches will be played in Sharjah and Abu Dhabi, whereas the final match of PSL2 2017 will be played in Lahore subject to security clearances. Below is the complete schedule of Pakistan Super League second edition 2017. All matches of Pakistan Super League 2017 will be played at two grounds – Dubai International Cricket Stadium and Sharjah Cricket Association Stadium as announced by the PCB.